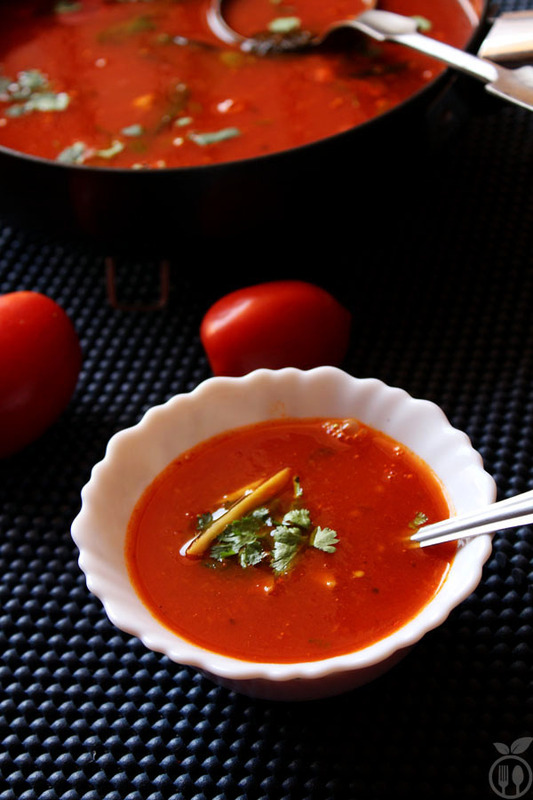 Tomato soup recipe is always available in any type of restaurant either Punjabi or Chinese or continentals. Some restaurants really make good quality of tomato soup. But now-a-days you can find ready-made packets of soup. But I hate ready-made soup. Even I don’t like ready-made food packets. In winter, I always try to add soup in weekly menu. In my family, we all like soup with rice especially, so always try to make it complete meal instead of starter. Strange!!! When I tried Mixed Bean Soup in the Mexican way, everyone was looking for rice with it… I didn’t make rice!!! This tomato soup is my mother’s recipe. She do not like garlic in any soup, so she always make tomato soup without onion and garlic. And that is totally new for me because I never imagine tomato soup without garlic. 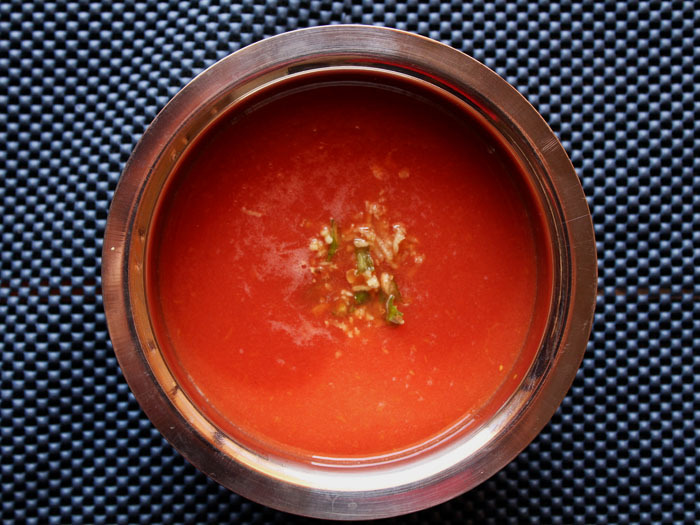 But, when, I have tasted this tomato soup, I am astonished by this recipe. And trust me you will defiantly love it. 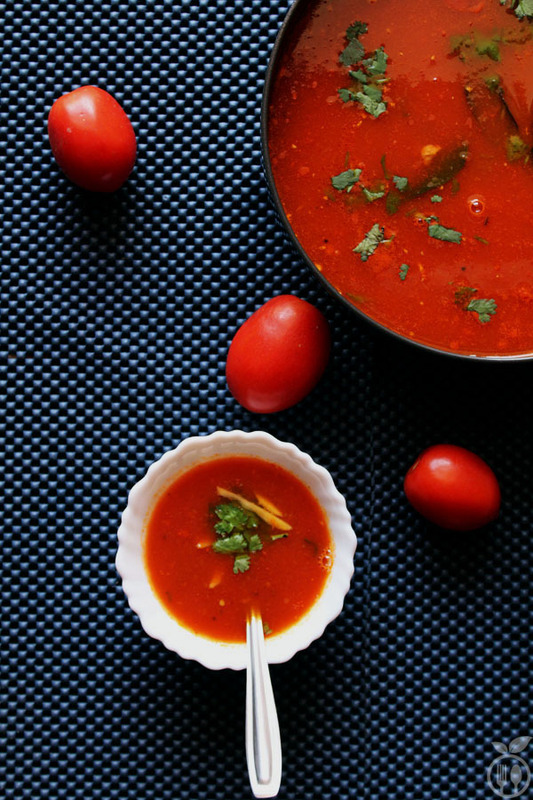 My tomato soup recipe is also there for people who do fasting regularly. So, you have this option open during fasting days… And for Jain tradition (the people who do not eat onion and garlic) this is super easy recipe. The main ingredient is Tomato. I suggest use fresh ripe tomato instead of savory unripe tomato. 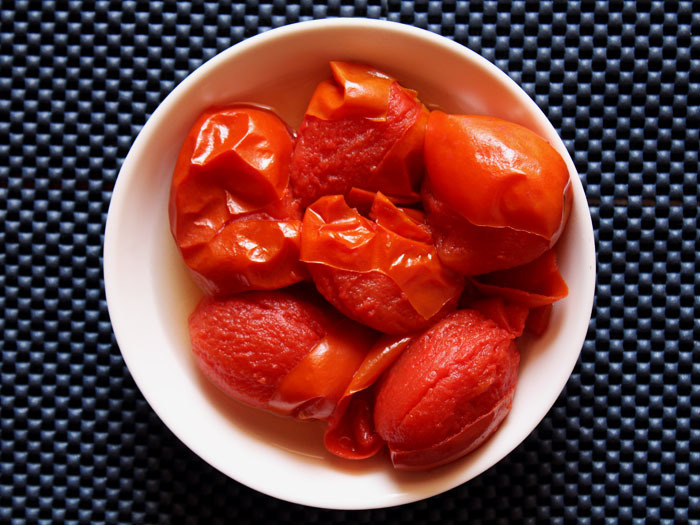 Boil the tomatoes till they become tender and you can peel them easily. Then using blender, blend it, make puree of it then strain it to remove seeds and bits of skins. 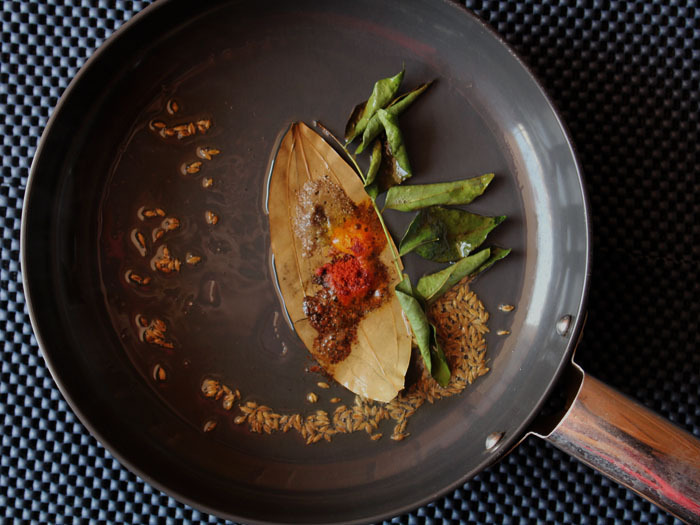 Add ginger – chili paste in puree. Then it time for tempering. Take some ghee and oil (you can also use butter), add all spices and add tomato puree and let it simmer for while, you can avoid dry spices like (turmeric powder, red chili powder and coriander powder). This soup has very light consistency rather than ordinary soups, because I do not have used any thickening agent like cream or corn starch. The texture is like Rasam (North Indian recipe). 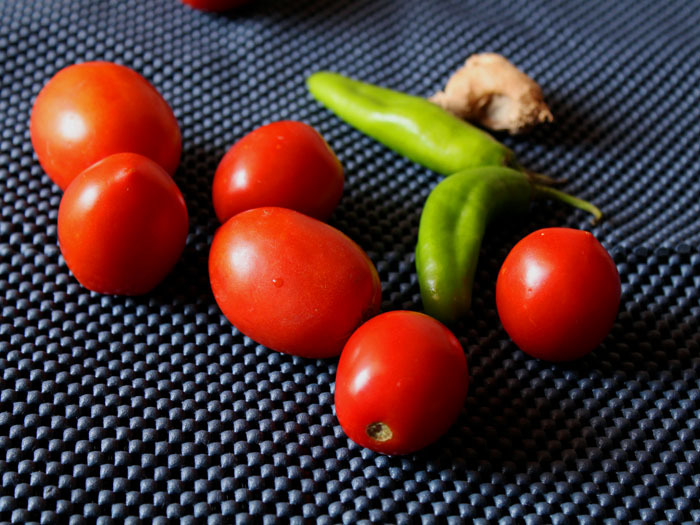 Boil the tomatoes till they become tender and we can easily remove the skins of them. You can also add beetroot in this recipe to make it healthier. To add them boil beetroot pieces with tomatoes and blend with tomato puree. This soup may taste more tangy but you can balance the tanginess with amount of sugar. You can also add some boiled green peas into this soup. While the soup is simmering, add the boiled green peas to make it tastier. 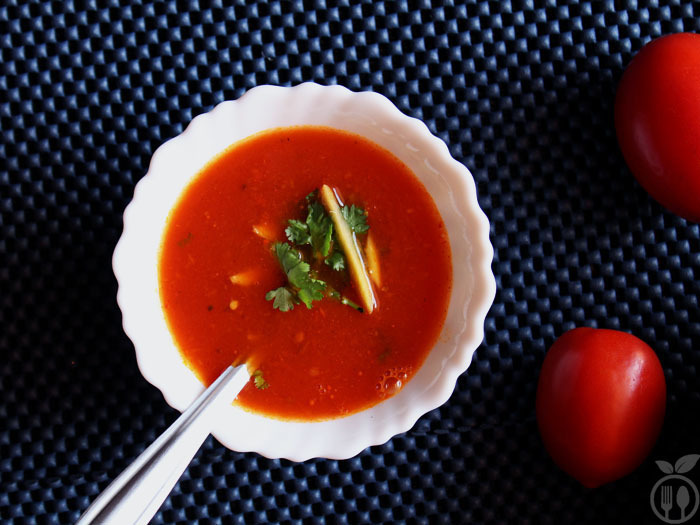 Tomato soup recipe is always available in any type of restaurant either Punjabi or Chinese or continentals. Some restaurants really make good quality of tomato soup. But now-a-days you can find ready-made packets of soup. But I hate ready-made soup. Even I don't like ready-made food packets. 1) You can serve this soup as starter with some crutons or some bread toast. 2) You can also serve this soup with rice. It tastes so good with plain steamed rice. I have two very dear friends who are both allergic to onions and garlic. Your recipe looks amazing and I will definitely make it for them. 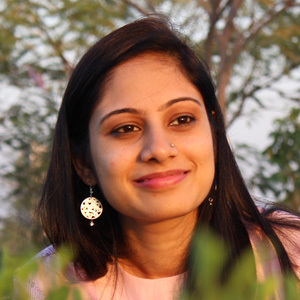 I have never heard of Jain culture, even though I am 66 years old and will be checking that out for sure. Thank you! Glad to know that you liked it..Stay tuned for more such recipes.. I love your site design and your food content. I am a tired Mom and love cooking and baking on weekends when time allows me to make cakes.